Born between January 20 and February 18, is the eleventh sign of the Zodiac, Aquarius; a masculine, fixed, positive, Air sign bearing the symbol, the Water-bearer. The 11th sign is also called the House of friends, hopes, and dreams. Aquarius zodiac sign is ruled by Uranus, the great awakener and the enigmatic Saturn being associated with uniqueness, eccentric and exceptional intelligence. In this article, we will explore the main Aquarius traits. Use the links below to navigate to the section you want to read first. Are you an Aquarius? Show your friends how awesome your zodiac sign is by sharing the infographic below on social media. 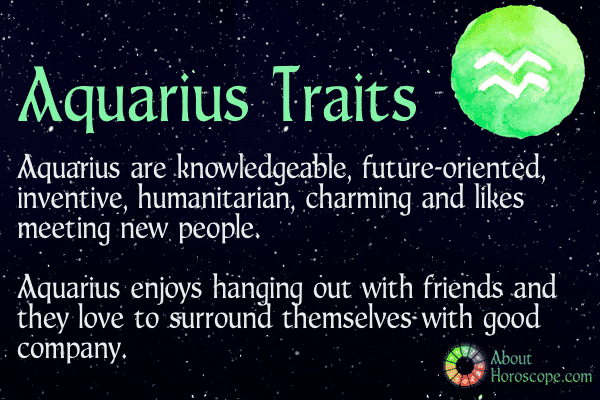 Aquarians are known to be friendly and very well liked. They love to surround themselves with good company who they can engage conversations with, covering all sorts of topics. With a good sense of humor, they love to lighten the mood wherever they go. Ruled by the planet of invention (Saturn), monotony bores the Aquarians, which is why they make conscious efforts to think out of the box and do their work in innovative ways. Aquarius is the sign of visionaries, unconventionality, and intellectual independence. Aquarius are the people who go against the flow. They are always after intellectual stimulation, constantly discovering something new, forming new opinions and stubbornly traveling their way regardless of what other people think. Aquarius are filled with contradictions; they like to be alone, yet they are social butterflies. They like to experience both sides and see both opinions as they formulate new ideas with their forward thinking, active mind. Aquarius personality lets everyone be free to think and be themselves. An Aquarius is never judgmental, they believe that we are all equal and entitled to our own opinions. They are fluent and very witty, they observe people and learn how to interact with others through observation. They can be masters of manipulation. They can deal with any type of personality and adapt to any situation. Anything new is an opportunity to Aquarius. Aquarius can act as an expert on any topic, they are very good at inflating their own importance. They feel it is merited because their eccentricity makes them exceptional. Conventional people beware, Aquarius likes to shock and deviate from the norm, this is how they live. Aquarius is known to pick at anyone they find weak or dull-minded. It is simply an easy target for verbal exercise for them, no harm intended although the other person may not take it lightly. Deep inside, Aquarius would never intentionally hurt anyone, it is their emotional detachment that prevents them from being considerate. Aquarius is a very free-spirited, unpredictable sign, and those born with this sun-sign are inclined to indecision. Aquarians will often change their mind about certain things, as the mood suits them. While typically intellectual, charming and well behaved, Aquarians will sometimes change their mind regarding important issues, or act in a very self-absorbed way. For the most part, Aquarians are concerned with the “greater good” and express humanitarian interests, for as long as those interests don’t conflict with their own. The Aquarius man is strong-minded and always seeks the truth. He has a strong desire to know everything that is happening around them. He is always multi-tasking as he wants to be preoccupied all the time. The Aquarius Man has a great imagination, intelligence and great determination to put his ideas into action. He has a special inclination for arts and machines, and thus, gadgets, computers, performing arts, music have a major significance in his life. He is very soft-spoken and polite, but fundamentally non-conformist. He doesn’t mind going against social norms or popular opinions when they want to bring about important changes in the world. Developmental activities and research interests the Aquarius Man a lot. Nevertheless, he loves doing social work too. He can be unpredictable though. He doesn’t have a fixed behavioral pattern. For instance, you may be thinking that he is enjoying the good times and expect them to go off on a trip, but he may surprise you by getting into meditation. He is enthusiastic, witty, affectionate and social. But he doesn’t get emotionally close to people easily. He will maintain some distance initially but when trust is earned, he will be a loyal friend for life. He is an idealist and it is difficult for an average person to live up to his high expectations. His relationships, both personal and professional, tend to suffer despite genuine attempts to adjust to circumstances. If there ever was an Aquarian man whose accomplishments are the standard for others to follow that would be NBA superstar, Michael Jordan who was born on 17 February 1963. Never has there been an athlete, celebrity or famous, accomplished person who transcended his field more than Jordan. “MJ” is universally recognized as the greatest basketball player in history. How much of an Aquarian in Jordan? He quit basketball at the height of his powers, to play baseball; a dream he shared with his beloved father. Jordan didn’t pay attention to the naysayers and charted his own course to baseball glory. Unfortunately, the baseball strike of 1995 cut short his dream just when his baseball statistics were climbing. Fortunately for the Chicago Bulls and the rest of the basketball crazy planet, Jordan came back to win three (3) more NBA titles and gave us several great memories of highlight reels and inspiring moments. The Aquarius woman is smart, independent and friendly. She is strong enough to conquer even the most difficult tasks. She is frank and has strong beliefs but is also open-minded and tolerant of others viewpoint. Famous for her affectionate nature, it is not difficult for her to make friends. She is popular in social circles. But she takes time to build an intimate relationship as she shies away from emotional commitment. She is truthful, independent and compassionate. She always tries to look at the larger picture, and will not shy away from taking the responsibility to work for the benefit of society. She can be rather unpredictable and impractical, and keeping up with her may become too difficult for others. One needs a lot of patience to understand her. But when they get her emotional space, getting along with the Aquarius woman becomes easy. An Aquarius woman sets the bar really high, and expects the same from others. This is why the she gets emotionally disappointed easily. False promises hurt her very much and she doesn’t forgive easily. She is intelligent and a born leader. Team-work interests her a lot. She can be a great asset to the firm she works for. Professional and social position and power attract her more than riches. Though she prefers a comfortable lifestyle, she rarely runs after money. Not the type to take half-hearted measures, she loves to test her limits and reach great heights regardless of the possible financial gains. She lives by her own rules. She respects others’ privacy and expect the same from others. She believes in peaceful coexistence and would never impose her views on others. Just from the first paragraph alone, it should go without argument that the best representative of the Aquarian woman is Oprah Winfrey who was born on 29 January 1954. How does one describe Oprah Winfrey? Superstar? Megastar? These adjectives may not be enough to encapsulate what Ms. Winfrey has done in show business and for her various advocacies. Oprah serves as an inspiration as one who rose from poverty and hardship to become one of the most influential people in the world. Forget the billions she made from her iconic talk show, “Oprah”, her magazine, “O” and from the movies. Oprah has dedicated her life to help impoverished children and women in third world nations find education. She has also contributed to bring more attention to the accomplishments of lesser-known African Americans in her movies, “The Butler” and “Selma”. Aquarians are usually very fast learners and will leave no stone unturned to achieve success in their chosen field. They pick up general concepts and ideas extremely easily — often just by speaking to someone for a few moments. They love to challenge the rules braving to go against the social norm. Original in their ways of thinking, they are frequently deemed as idealists and rebels with a cause. They are progressive thinkers and ultramodern in their techniques. As they require intellectual stimulation, they are at their best when their pursuits give them the chance to express their brilliant memory, creativity, knowledge, wisdom and love for freedom and humanitarian causes. Careers in television, radio, science, astrology, astronomy, Information technology, archaeology, aviation, space programs and charity organizations are perfect for this sign. When in love Aquarius is communicative, imaginative, witty, candid and friendly. Spending time with this intelligent person will be fun as an Aquarius will always come up with great ideas to have a good time. They are faithful, especially when they have found their soul-mates. They are supportive of independent partners because they themselves guard their independence fiercely. They motivate their partners to search for better job opportunities or to take up advanced courses or refresher courses that can help them to get a better job position; they overlook conventional options and aim for a better tomorrow. Aquarians’ unpredictability can be good or bad to any relationship. Oftentimes, it is a wonderful trait which always keeps a relationship fresh and new. Sometime though, it can be frustrating and seem insincere. Aquarians are very independent people, and for them relationships will require a necessary amount of “space” and time for themselves. Crowding and restricting an Aquarian will often cause an Aquarian to run off in search of more freedom, space and an environment which better tolerates their unpredictable and very independent nature. But if an Aquarian finds that “just right” environment, they make wonderful, loving and very giving partners. Love is universal and selfless to the humanitarians of the Zodiac. The best love matches for them are Aries, Gemini, Libra, and Sagittarius. Worst matches are Taurus and Scorpio. As Aquarius is said to govern the legs from knees to ankles and the circulation of blood. Its natives are susceptible to ailments particularly in the legs and ankles, such as cramps, and are also liable to spasmodic and nervous complaints, as well as wind, catarrh, diarrhea, dropsy, goiter and delirium tremens. They should have a diet which consists of substances that are good for their circulatory system and keep their blood sugar level in check. Walnuts, ocean fish, pears, lemons, oranges, apples, oysters, radishes, corn, peaches, lobster, lettuce, tuna, clams and grapefruit are good for them. Lucky days for Aquarians are Sunday and Saturday. 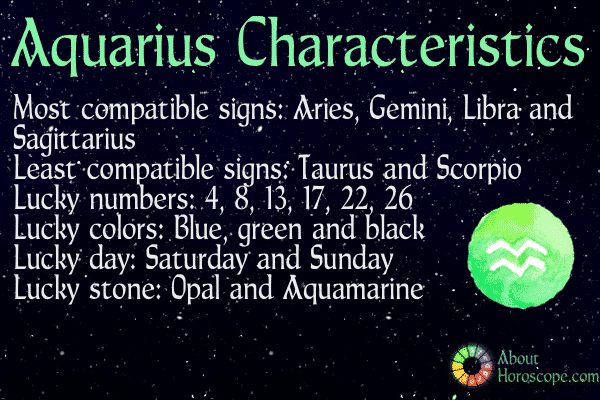 Wondering what are Aquarians lucky numbers? Well, they have several of them, 4, 8, 13, 17, 22 and 26. The colors that are known to be lucky are blue, blue-green, gray and black. Have you met an Aquarian? Do you have Aquarians friends? Are you an Aquarian yourself? We would love to hear everything you know about Aquarius traits and share your opinions with us, using the comments module below.